Red orange natural pigment closely related to the yellow orpiment. The two minerals are often found in the same deposits. Although it occurs perhaps as widely in nature as orpiment, realgar appears not to have been used so widely. Realgar is a highly toxic arsenic sulfide and was the only pure orange pigment until modern chrome orange. Word origin: The name "Realgar" comes from Arabic rahj al ghar = powder of the mine. This Gospel lectionary consists of 264 folios with text and sixty illuminations and is valued at more than US$1 million. The large number of illuminations distributed throughout a manuscript of this type is very unusual; they are of high quality and have a rich palette which includes vermilion, lazurite, orpiment, lead white, realgar and pararealgar. 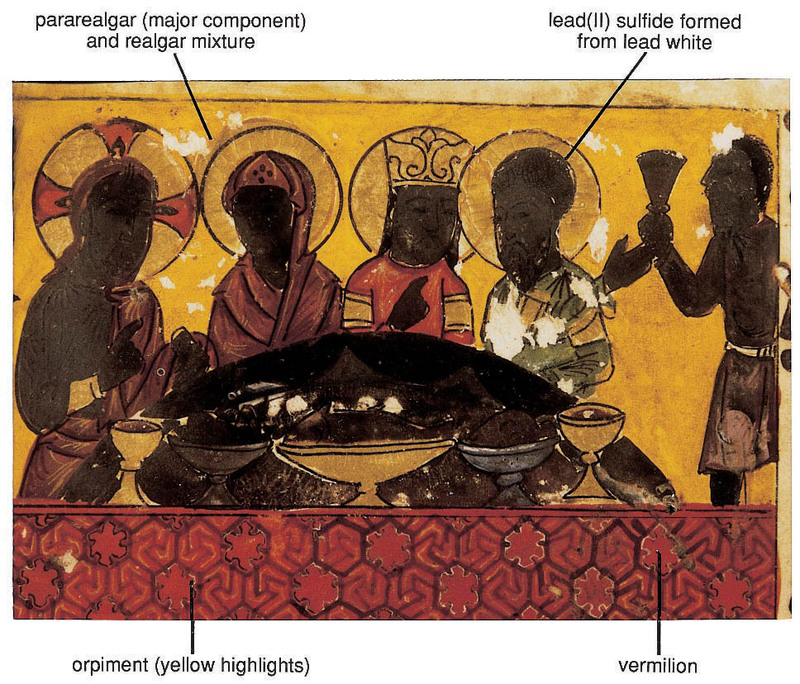 Some of the illuminations have suffered serious deterioration of the white pigment, which has turned black in parts. The phenomenon is most striking where the faces of the figures, apparently initially coloured with a mixture of white and red pigments, are affected, creating blackened areas.